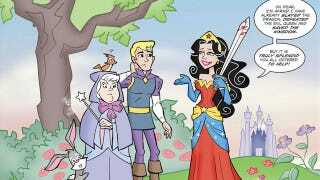 WHAT IF WONDER WOMAN WAS A DISNEY PRINCESS? | Diana doesn't need a prince, even if they do make good cover models. By Bill Walko, of the webcomic The Hero Business (via reddit). Saturday Morning Cartoons – Ben Kenobi on the run from Anakin & the return of Frankenhole! Saturday Morning Cartoons - Ben Kenobi on the run from Anakin & the return of Frankenhole! Portal turrets channel The Nightmare Before Christmas with "This is Aperture"